Ballet Terminology A-Z! Bookmark this page and check back often and we continue to write more. In a Grand Plie’, the back should be straight, aligned with the heel and the legs are turned out with knees over the feet. As a movement, it should be fluid. It may also be in preparation for another movement such as a leap. 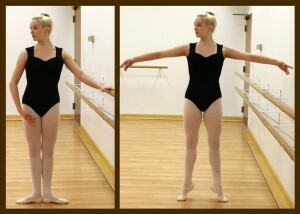 Alyssa Ness demonstrates a beautiful Grand Plie’ for our post.